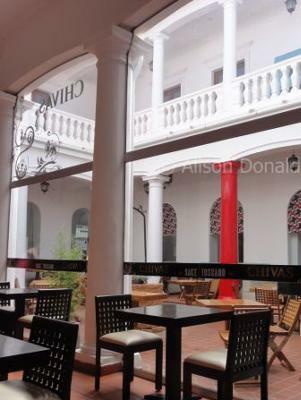 Time of visit – Thursday lunchtime: This restaurant is in a very convenient location just 3 blocks away from the main plaza in Santa Cruz, Bolivia. 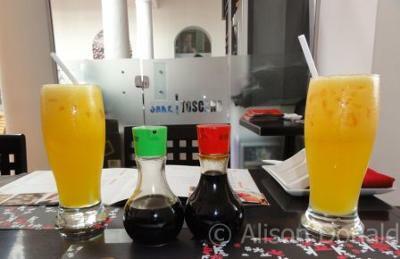 It offers Japanese and Italian cuisines and has been open a year. The building was originally a large (and very grand) family house. Local by-laws thankfully prohibited them from removing or permanently modifying original features such as the well in the courtyard and the beautiful columns. One of these has been painted a striking red – the exact same red as has been used in the interior details. This kind of attention to detail in design is rarely seen here in Bolivia. 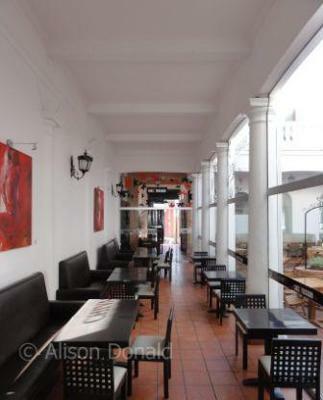 You can sit inside and enjoy their powerful air conditioning or select a table in the internal courtyard. There is also a patio at the rear of the restaurant where events are held in the evening. Furthermore they are converting some of the upstairs rooms (formerly bedrooms) into smaller dining rooms. The “Italian” part of their menu has been divided into entrees, soups, salads, meat and chicken, fish and seafood. The sushi part of the menu is also detailed. We chose Sake Toscano as we were both hankering for sushi. We chose the plato combinado (a variety platter) for 259Bs (around US$37), which consisted of 30 pieces of sushi / sashimi and was designed to feed 2 or 3 people. 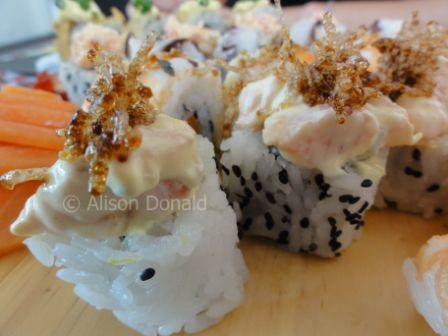 As you can see from the accompanying photos (which actually make me hungry), the sushi looked delectable. The sushis were very inventively presented and tasty but actually mainly consisted of the same filling (battered and deep-fried prawn). The salmon and octopus had definitely been frozen and indeed you may expect this from land-locked Bolivia but I have previously eaten seafood in Santa Cruz that I can’t believe had been in the freezer. For my tastes, the sushis were lacking the slightly sour taste that I associate with this dish. Also, in the style of most South American sushi they had managed to incorporate mayonnaise/ cream cheese into the filling and/or decoration. The sashimi (pure slices of raw salmon) was a bit of a let down by virtue of using frozen salmon. The platter was accompanied by a limp garnish of cucumber that looked like it could have been yesterday’s. This was a shame when such effort had been put into constructing the beautiful sushi. Having said all of the above I should point out that we would have eaten all of it except that we were almost bursting by the end. 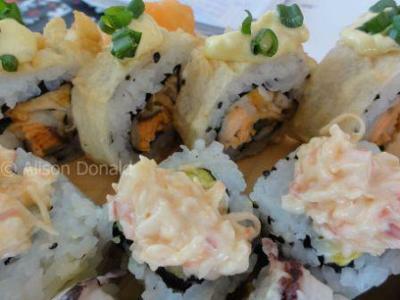 There are better places for sushi in Santa Cruz but this one is very well located and in a beautiful building and with attentive waiting staff. If you have a craving for sushi try this place. My companion commented to the waiter that the maracuyá juice was particularly delicious and rich in flavour and that it must have been from at least 5 fruits. He said he didn’t know as they buy the juice in sachets of pulp to which more water and sugar are added to taste. This is quite a common way for householders to buy pulp here and had he not told us we would not have realised. I would certainly go to Sake Toscano again though next time I might try the Italian menu instead. The atmosphere was very relaxing and pleasant and the waiting staff very patient with us and our endless questions. We were there well over two hours and time flew so much that my companion was nearly late to her next appointment. Thursday is ladies night and for groups of 4 or more women will receive a free bottle of wine or a jug of sangria. There is also live music.